This week’s recomMondaytion is actually an ARC review. D.B. Sieders was so kind to give me a free copy of this audiobook. I absolutely loved the first part in this series, Lorelei’s Lyric. But I wasn’t quite sure what I could expect from the second part because Ilsa wasn’t the most likable person in book 1. Turns out, I loved this story at least as much as book 1! Firstly, Stefanie Kay’s narration was absolutely fantastic again. She has a great array of different voices and accents. It’s easy to differentiate between characters and she kept me absolutely captivated. As for the storyline, I really liked how the events from book 1 had bigger consequences that led to the events in book 2. It was actually quite suspenseful! While this book would work as a stand-alone (everything is well explained), it also has a solid series-feeling to it. And I loved how D.B. Sieders laid the groundwork for many more parts. I’m definitely looking forward to more elemental guardians, especially to more Bruce! Ilsa became a very likable and enjoyable character in this book and I crushed hard on Paul. He’s so thoroughly great! This is definitely a credit-worthy series for me and I recommend it to anyone who enjoys Fantasy Romance or Paranormal Romance. No one believes Ilsa is worthy of ruling the Rhine River Kingdom, including Ilsa. Sure, she wields plenty of mermaid magic and has a winning personality, but responsibility? Not her thing. So instead of embracing her role as river royalty, Ilsa opts to extend her holiday in the New World. Frolicking with mortals is her M.O. – until she answers a distress call from an endangered species in the waters near Chattanooga. After her close encounter with a motorboat threatens to expose the world of elemental guardians, Ilsa partners with biologist and unlikely ally, Paul Pulaski, to cover her tail. Worlds collide and sparks ignite between Princess Ilsa and her diamond-in-the-rough mortal, Paul. But can they survive monster hunters, a rival scientist with a grudge, and a dark force that could destroy mortal and elemental alike? 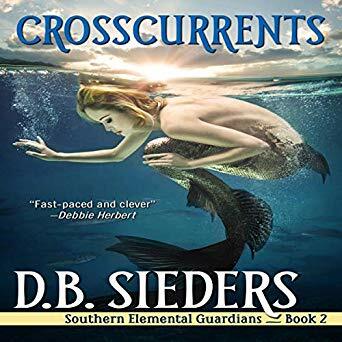 Great review, this book looks and sounds absolutely amazingly fantastic I really love mermaids books, thank you so much for sharing your awesome post. Haha, it indeed was amazingly fantastic!! Great review! Wasn’t familiar with this author and these books yet but it looks awesome!! Glad that you enjoyed this. Lovely review. I don’t listen to audiobooks, I admire those that can. My mind wanders too much and I don’t hear most of the story. Great review! I hadn’t heard of the first book – I don’t think, unless I heard it from you already 😉 – and will take a look! Wonderful post! Mermaids seem to be a popular fantasy/paranormal topic these days and it makes me so happy! Mermaids rock!! They’re such awesome creatures, maybe they’ll be the new vampires 😉 …. oooor vampire mermaids?!? So glad you enjoyed this one just as much as the first 🙂 Great review! Thank you 🙂 It’s a really nice series. You might like it, too! Your recommendations have been amazing so far. Just finished another Mister Bodyguard! Definitely will check this latest one out! Thanks again for all tou do! Ooh, I loved that one! The entire Morgan brothers series is so, so good. Definitely one of my favorites.